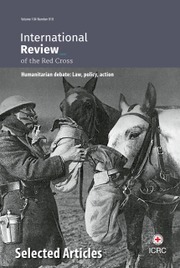 The International Review of the Red Cross is a peer-reviewed journal published by the International Committee of the Red Cross and Cambridge University Press. It promotes reflection on humanitarian law, policy and action in armed conflict and other situations of collective armed violence. A specialized journal in humanitarian law, it endeavours to promote knowledge, critical analysis and development of the law and contribute to the prevention of violations of rules protecting fundamental rights and values. The Review offers a forum for discussion about contemporary humanitarian action as well as analysis of the causes and characteristics of conflicts, so as to give a clearer insight into the humanitarian problems they generate. Finally, the Review informs its readership on questions pertaining to the International Red Cross and Red Crescent Movement and in particular on the activities and policies of the Red Cross. Digital Archives The extensive archives of the International Review of the Red Cross are now available online. The archive of the current journal is available below. For more information, and links to the other archives, please click here.